I don’t think I’ve ever talked to a small business owner that didn’t want to increase their revenue. Everyone wants to be successful but they often spend too much time focusing on what I call busy work. Busy work is defined as things that need to be done to keep the business operating behind the scenes but doesn’t create any additional revenue. This busy work makes it hard for business owners to take time away from the daily hustle and bustle to really evaluate what they’re currently doing. I’ve listed 5 of the top reasons your business may not be generating the type of revenue you want or need to stay in business. Not enough time. Too busy working in your business and not on your business. An owner should not be spending their time doing data entry and administrative work. If you’re the office manager, who’s out doing the marketing and prospecting. There’s not enough time in the day for you to do both. Not investing in the right support. Trying to be a complete do-it -yourselfer and not hiring skilled, trained professionals. You have to learn to let go and let good people in that genuinely want to help you grow your business. No foundation. Not having the right systems and processes in place. Ask yourself, and be realistic, if you had a significant increase in sales would your business be in a position to handle it. No true focus. When you’re being pulled in several different directions, it’s really easy to lose sight of things. In order to be successful you must keep your eye on the prize “so to speak”. Leaving Your Core Strengths Behind. Doing everything but focusing on tasks that will help you generate more revenue. You started your business because there was a key area that you had some expertise in it. That area is what you should be focusing on. An example would be, if website design is your niche, let someone else do the administrative. If you’re honest with yourself, how many of these reasons are blocking your path to success? The good news is that it’s not too late to breathe new life into your business. 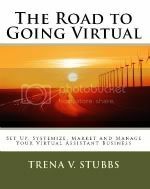 A virtual assistant can be an easy, affordable solution. Virtual Assistants are the wave of the future. They allow business owners access to the help they need at a cost they can afford. Virtual Assistants, often called VAs, provide a variety of support that will allow you time to direct your focus on generating new sales. Consider going virtual for your backend office support. If you’ve decided to go virtual but have no idea where to start, contact an Apex representative today at 866-926-7362 or visit us online at http://www.apexassisting.com . We’d love to help; our free consultations provide you with tons of free information and solutions for taking your company to the next level.